I want to know if Naachni is same as Quinoa (in English) which is grown in South America - Peru, Chile? If they are different grain, yet, both are high in protein, iron + more nutrients. Nachni and quinoa are two different food ingredients. Nachni - finger millet is a grain(grass plant). Quinoa is a seed of leafy plant like spinach. Both quinoa and nachni have some similarities where nutrition is concerned. 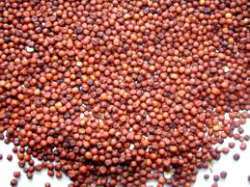 Looks wise nachani or finger millet is reddish black/brown whereas quinoa is creamy white. Quinoa is originally a south American ingredient and not so commonly known or available in India. It does not have a Indian name. Quinoa is a rich source of protein. It has essential amino acids and minerals. It is gluten free and is easy to digest. You can cook it like rice or upma. Wash it well before cooking. Nachni is commonly available in India and is used in Indian cooking since a long time. Nachani is known as finger millet in English. It is one of the health giving rich grains. It contains high amount of calcium and iron, protein. It has balanced amino acids, vitamin A, vitamin B and phosphorus. Nachni is gluten free and has more fiber too. There are many ways you can add nachni/ragi/ finger millet to your diet. You can use it as a whole grain or in the flour form. You can make ragi roti (nachni bhakri, as it is known in Maharashtra), ragi porridge, ragi mudde(ragi balls - Karnataka special), payasam, ragi dosa, pancakes, mixed flour parathas, thepla etc. Nachni - finger millet - ragi is easy to digest and is given to babies as well as elderly people in the form of sprouted ragi flour which can be cooked quickly. Comments for Is Nachni same as Quinoa? No Sushant, it is not Rajgira. Rajgira is Amaranth in English. Thanks for valuable information. What is it called in punjabi? As explained elsewhere on this page, Quinoa does not have Indian name as it is not a native seed/grain from India. Rajgira/Amaranth is very easily available in Maharashtra at least. It is a fasting food for Ekadashi and similar vrat days. You can gorge on Rajgira chikki which is very nutritive and tasty. Excellent and light snack. hello everyone, Quino in hindi is known as kangni ke rice. its like millet. yoy have to remove the above skin and clean it and then can eat . if any one have is suffering from celiac disease or wants to get quiono or kangni ke rice can write to me at sonalsharma1181@gmail.com. happy to help everyone. thanks. This post that explains the difference between nachini and quinoa was much informative. I was not so interested in cooking but the recipes that are shared here on the website has made me interested in cooking. Do not know for the rest of India, but, have seen Quinoa available in store in Gurgaon. I think we have kodri, samo, or morio which can be the same as quinoa. Even amaranth has as much nutritional value as quinoa. Please tell us what is Quinoa called in Hindi? It will be of a lot of help. Because lot of us here do not know the correct Hindi name for Quinoa. We tend to confuse it with some other Hindi name of some other grain. I have not seen Quinoa in Indian supermarkets. Please let us know if you have any idea where it is available? Quinoa is a South American food grain (actually a seed). So quinoa does not have a Hindi name or any other Indian language name. I haven't yet come across any place in India where quinoa is easily available. But I keep checking the supermarkets and will let you know when I come across it. The first time I got it from a family member from USA as I had heard about it and even now that is how I get it once in a while. 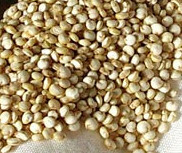 Our Indian grain/seed Amaranth is more nutritious. So you may try that as it is available easily in India. Amaranth is known as Ramdana or Rajgira in Indian languages. If you are not able to get amaranth in your place, you may try to get amaranth online at http://sosorganics.com. I found this site while searching online. I haven't actually tried it.